I was raised a vegetarian - the entire time I lived with my parents in Chennai. I hail from an orthodox family and was brought up by very conservative parents, who were huge proponents of vegetarianism - so much so that, we did not even include egg in our diet. Also, alcohol was taboo and my brother & I were constantly reminded about how baneful indulging in any form of alcohol can be. So, the topic of this blog post is quite a contrast to my upbringing and background - well, what else can I say about me, pairing Lamb Shish Kababs with wine and writing about it? That said, consuming meat & wine (in moderation - for the most part ;)) is my gradual evolution and conscious choice after landing in the United Stated more than a decade ago - and today wine pairings with delicious Indian food (both Vegetarian and Non-vegetarian) is one of my most cherished passions. So all is well. But, the only time I feel a little regret is when I realize that, during my entire formative years in India I never tasted any non-vegetarian foods or dared to try some of the most delightful street food delicacies like Shish/Shami Kababs, Kheema, Fish Fry and on and on. But, what I lack in exposure, I have tried to compensate with a lot of research and intense interviews (with every chance I got) of my non-vegetarian and fish eating Indian friends & acquaintances from North/East India. Based on my experience, the North Indians seemed most exposed and well versed with Kababs - maybe because Kababs were supposed to have originated from the Mughal Empire's cuisine - when they ruled India from Delhi as their capital. And of course, I also never cease to jump at the first opportunity to try any such delicacies that I may have missed out in the past. One such delicacy that I have fallen for in the very first bite is kababs - not only it is widely found in all the major cities like Delhi, Lucknow, Goa etc. - it is a mouth watering street food full of Indian spices' filled flavors. So, it was about time I paired them with some amazing vino. 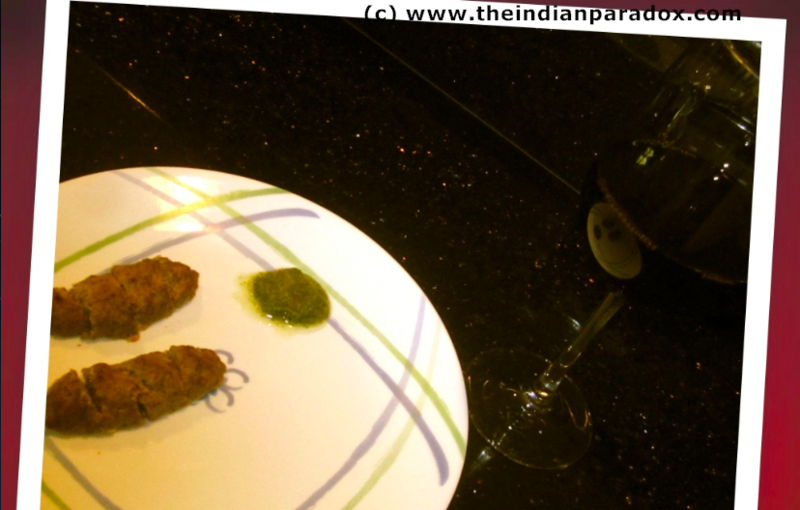 So I dutifully approached Rashmi Rustagi and learned to make Lamb Shish Kababs. Rashmi (who hails from Lucknow in North India) also told me that Shish Kabobs were usually served on the streets of Lucknow with a coriander tomato chutney. Having never been to Lucknow in India - I was listening wide-eyed like Bambi to Rashmi's stories about Lucknavi street foods! When I tried my own Lamb Shish Kababs, I ensured to make the chutney too and the results (as seen above) were quite satisfactory - for the eyes, nose and taste buds alike! When I had made up my mind to try out an Indian street food made of lamb, the first few wines that came to mind were, Côtes du Rhône, Châteauneuf-du-Pape or a fruit forward Malbec. So, imagine my surprise when I chanced upon a red wine from the Douro DOC! And Ithe wine associate in the store reflected my thoughts and affirmatively recommended this wine when I mentioned lamb kababs spiced with cumin, mint and coriander flavors. I have to admit that I have been biased and relishing a ton of Portuguese wines recently (maybe because of all the mind boggling, great Portuguese wines I got to taste in my recent trip to Lisbon). So it was no surprise when I fell in love with this wine at my very first sniff and sip! On the nose, flavors of vanilla beans, white flowers (jasmine? ), dark fruits (Blueberries, blackberries and cassis) jumped right out. On the palette, this wine was unbelievably aromatic! And I got more red fruits (sour cherries and raspberries) than the black fruit flavors that were so evident on the nose. The 14.5% alcohol was quite obvious when I gulped down my first sip - there was definitely heat and finally I was left with this predominant black pepper after taste - what a multi-dimensional wine! I chewed on the lamb kabab followed by a sip of the Douro wine. This wine is meant to be consumed with lamb! And the peppers in the wine complimented oh so beautifully with the cumin, mint and cardamom (used when grinding fresh Garam masala) spices infused in the Kabab. Believe me when I say that, you too will feel like royalty if you wine and dine like this!